We’re very excited to reveal this year’s shortlist for the Readings Children’s Book Prize. This Prize celebrates exciting new voices in Australian children’s literature. This year’s six shortlisted titles are all for readers between the ages of 8 to 12. This year’s shortlist is exceptionally strong and brimming with adventure. It exempliﬁes the wonders of reading, introducing and transporting readers to unfamiliar places – from the high seas to the Stone Age, and deep into fantasy worlds ﬁlled with magic and mystery. Young readers will feel empowered by seeing characters that display fearlessness, curiosity and kindness in the face of danger and the unknown. Expect lots of humour and clever world-building – these are books that kids will adore. You can read judges' comments for each shortlisted title below. This year’s judging panel is made up of four children’s book specialists: Alexa Dretzke (Children’s Buyer at Readings Hawthorn), Dani Solomon (Assistant Manager at Readings Kids), Daniella Robertson (Children’s Specialist at Readings Malvern) and myself. We’re delighted that children’s writer and editor Davina Bell will be joining the panel as a guest judge to help select the winner from the shortlist. Here is an action-packed Stone Age quest. Tarin has been exiled by his Clan of the Mammoths following an unlucky mishap, and so we join him on a journey to deliver an appeasement oﬀering to the Earth Mother. Struggling with a twisted foot, there’s new danger for our hero at every turn in this epic tale of survival. The in-depth details of Tarin’s world will fascinate readers, and images of the harsh, untamed landscapes will linger far beyond the pages of the book – as will the vivid smells of the hostile, brutish Boar Clan that Tarin ﬁnds himself up against. For ages 8 and up. Continue the adventure: Clan of Wolves (Book 2) and Cave Bear Mountain (Book 3) are both available now. Morrigan Crow has been magicked away from her crummy, cursed life to the enchanting land of Nevermoor, and what a joy it is to be swept along with her. Nevermoor is ﬁlled with all of the best things, like a giant talking cat, a magical hotel with rooms that change to suit moods, and an eccentric mentor. To stay in this world, the Morrigan must pass a series of trials and join the secretive Wundrous society. This un-put-downable novel is wildly imaginative with great characters, exquisite detail, and universal appeal. A great read-aloud to share with the whole family. Continue the adventure… Book 2 (as yet untitled) will be published in October of this year. Tamara Moss has created a riveting tale rich in mythology and packed with swords and sea monsters. Desperate to see the world beyond her small island home, Lintang seizes an opportunity to climb aboard the ship of the infamous Pirate Queen Shaﬁra and her ﬁerce crew. Cue a high-stakes and high-seas adventure. Lintang’s world is populated by strange, sometimes scary creatures called mythies. Pages from The Mythie Guidebook are littered throughout the book, introducing readers to the diﬀerent mythies they encounter in the story. As Lintang discovers, these creatures also lie at the heart of the story’s central mystery. Continue the adventure… Lintang and the Forbidden Island (Book 2) is available now. Set in Allora, a magical town of ﬂying ﬁsh, this beautifully written story has the feel of a classic fable. 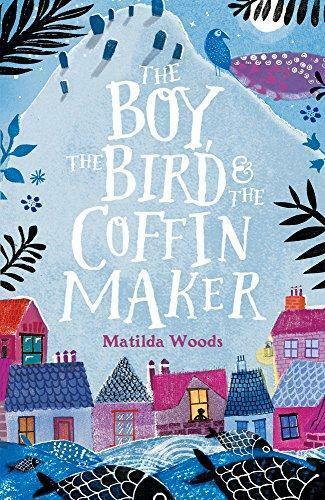 Coﬃn maker Alberto is accustomed to living alone, but after noticing some food disappearing he opens his home and heart to the frightened boy, Tito, and his magical bird who have been visiting. Matilda Woods skilfully handles some dark themes. Her touches of magic and whimsy and the dreamy sheen of her prose make it safe for young readers to consider loneliness, grief and sorrow at a distance. This stunning book is stylishly illustrated by Anuska Allepuz. Bronte Mettlestone reluctantly becomes an intrepid heroine in this funny, quirky novel about family. Following instructions in her parent’s magical will, she must set out to deliver gifts to her 10 aunts, each one weirder than the next. It soon becomes clear that there’s a mystery to be discovered and solved in her parent’s instructions. Bronte is a sensible, kind and resourceful traveller who takes everything in her stride, whether she’s winning an elﬁsh medal or starting an avalanche. Jam-packed with love and laughter, Jaclyn Moriarty’s ﬁrst book for younger readers is lovely and fat and features energetic illustrations from Kelly Canby. Six friends and a dog fall into a river and ﬁnd themselves marooned in the land of the peaches – odd little creatures who believe the kids are spirits sent to defend their home. As the story switches to focus on each kid, Campbell Whyte’s artwork shifts to reﬂect their diﬀerent personalities. Home Time has nostalgic appeal but also feels refreshingly new, calling to mind popular cartoons like Steven Universe and Adventure Time. This is a dazzling book that kids will spend hours poring over. Between the chapters are pages that function as a ﬁeld guide to the book’s world, and Australian readers may also notice some familiar features within its carefully constructed borders. For ages 10 and up. Continue the adventure… A second book is in the works, but no release date is yet available. Look out for the winner announcement online in late April and in the May edition of the Readings Monthly. The 2018 winner will receive prize money of $3,000.